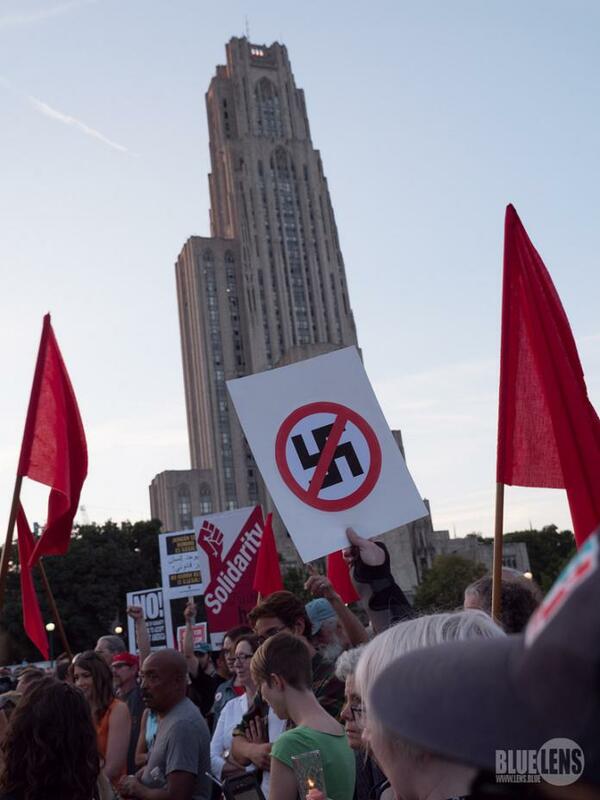 Pittsburghers gathered together in Schenley Plaza to mourn for the dead and injured while organizing against hate, bigotry, white supremacy, and so much more. As a woman of color, I fear for my safety on a regular basis. I dread violence not only because of my gender, but because my ethnicity is another element of my identity that makes me vulnerable. It feels as if a neon target has been painted on my back for everyone to see. Despite being light-skinned, my heritage is conspicuous to those who regard it as inferior — making the exact color of my skin irrelevant. My culture and my language have acquired a negative connotation in the eyes of those who hate diversity. My fear has evolved from the usual state of terror women feel while walking alone at night — now I am careful to not even speak my native language in public spaces. Every element comprising my identity has been rendered undesirable. Last year in Charlottesville, society witnessed the unabashed display of white supremacy in the “Unite the Right” rally. For the first time, I truly understood the paralyzing fear of becoming a victim of violence that women of color experience every single day. To be completely honest, I have always benefited from my ability to pass as white. I do not suffer discrimination on a daily basis because of the color of my skin. However, as I watched Neo-Nazis marching unashamedly, holding their tiki torches and ramming into a crowd of counter-protesters on national news, I was quick to grasp the implications. The realization that the person occupying the White House truly did not care about my well-being struck me harder than it ever had. Trump’s comment about “very fine people on both sides” while hundreds of Neo-Nazis paraded around the city and incited violence served as a reminder that I am not safe anymore. For the first time since election night, I understood the ideology that Trump’s victory validated. For those that claimed the President is not racist, I have to tell you that your argument is irrelevant. Even if Trump himself does not believe white to be superior, he does not explicitly condemn it. The President of the United States is at best ambivalent when it comes to racism, and people of color are forced to confront the implications of that in our everyday lives. When it comes to racism, it is black and white. There is no room for middle ground. Neutrality translates into inaction. For a person of color, inaction results in violence. As I fear for my own safety and my loved ones, I want to believe those that hate us are a minority. I want to believe the failure of “Unite the Right 2” is a sign that violent white supremacists exist in packs of maybe dozens rather than hundreds in our country. The amount of counter-protesters and members of the press gives me hope that those who believe people of color are equal under God exceed those who wish to see us exterminated. As a Latina woman and an immigrant, I do not have a choice but to believe racism, sexism and xenophobia are not embedded in people’s upbringing. I need to believe people are able to evolve and are able to learn to accept different skin colors and cultures. The alternative is that my safety from hatred will never be guaranteed in this country. I have to convince myself and others that it is only a small number of people who crave to run us over or shoot us down. Political ideology should not deepen the division so much that we are unable to agree on a simple fact: white supremacy has no place in modern society. We cannot erase the pain slavery caused, the Japanese internment camps or the Holocaust. It is impossible to change the mistakes of previous generations, but we can prevent it from happening again. These sudden bursts of violence are symptoms of a disease that has proven to be incredibly contagious. Validating our fears is the first step towards finding a cure.